The Saab 37 Viggen "Thunderbolt" is a Swedish single-seat, single-engine, short-medium range combat aircraft. 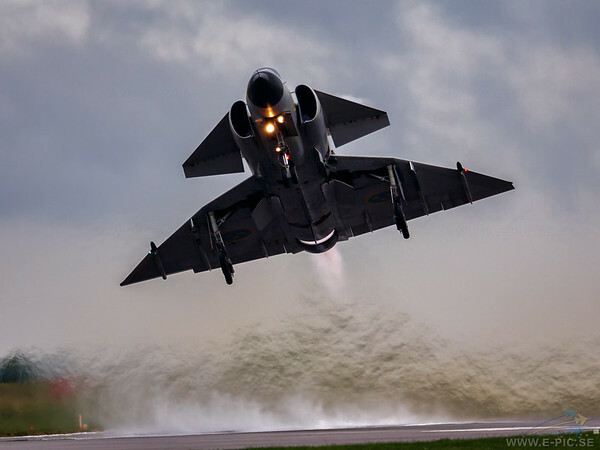 Development work on the type was initiated at Saab in 1952 and, following the selection of a radical delta wing configuration, the resulting aircraft performed its first flight on 8 February 1967 and entered service in 21 June 1971. The Viggen holds the distinction of being the first canard design to be produced in quantity. Several distinctive variants of the Viggen were produced to perform the roles of strike fighter (AJ 37), aerial reconnaissance (SF 37), maritime patrol aircraft (SH 37) and a two-seat trainer (SK 37). In the late 1970s, the all-weather fighter-interceptor aircraft JA 37 variant was introduced.